50 Commonwealth (260 Berkeley) is located on the SW corner of Commonwealth and Berkeley, with 48 Commonwealth (255 Berkeley) to the east, across Berkeley, 54 Commonwealth to the west, 282 Berkeley (29 Commonwealth) to the north, across Commonwealth, and the Church of the Covenant (67 Newbury) to the south, across Alley 436. 50 Commonwealth (260 Berkeley) was designed by architect George Nelson Jacobs and built in 1925-1926 as a nine story, 40-family apartment house. Plans for the building — including elevations, floor plans, foundation plans, and framing plans — are included in the City of Boston Blueprints Collection in the Boston Public Library’s Arts Department (reference BIN N-11). 50 Commonwealth replaced two townhouses at 50 and 52 Commonwealth which were acquired in July and August of 1925 by William B. Cohen and his brother-in-law Edward Watchmaker, trustees of Commonwealth-Berkeley Associates. They subsequently razed the two houses and on September 30, 1925, filed the original permit application for the new building. Click here for an index to the deeds for 50 Commonwealth. William B. Cohen was a real estate dealer. He and his wife, Anna (Rudnick) Cohen, lived in Brookline and later in Newton. Edward Watchmaker was an insurance broker. He and his wife, Mae (Rudnick) Watchmaker lived in Brookline. In about 1930, a restaurant was opened on the Berkeley Street side, known as The Ibis. It remained until about 1939. From 1940 to about 1944, it the location of Wilbur’s Restaurant, and from about 1945 to the mid-1950s it was the Mary Stuart Dining Room. By 1958, it was the location of Maitre Jacques, which remained there in the 1970s (called Maitre Jacques Le Bourguignon in the later years. By 1981, it was the Front Street Restaurant. The space continued to be used as a restaurant until the mid-1980s. 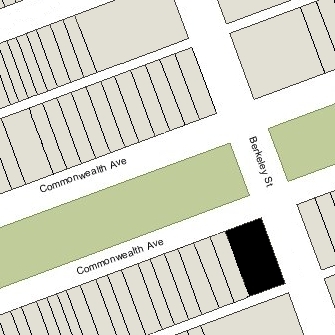 In December of 1939, Commonwealth-Berkeley Associates acquired the vacant lot next door, at 54 Commonwealth. On July 27, 1966, 50 Commonwealth and the lot at 54 Commonwealth were acquired from William B. Cohen, his wife Anna (Rudnick) Cohen, and their daughter, Rosalie (Cohen) Geller, trustees of the Commonwealth-Berkeley Associates, by real estate dealer Nathan R. Miller. On March 26, 1971, both properties were purchased from Nathan R. Miller by John T. Manelas, Jr., trustee of the Grosvenor Realty Trust. On September 18, 1985, 50 Commonwealth and the lot at 54 Commonwealth were purchased from John T. Manelas, Jr., by John R. Giles, trustee of the 50 Capitol Realty Trust. On December 16, 1985, John Giles converted 50 Commonwealth into 40 residential condominium units and two commercial “office suite” condominium units, the 50 Commonwealth Condominium. 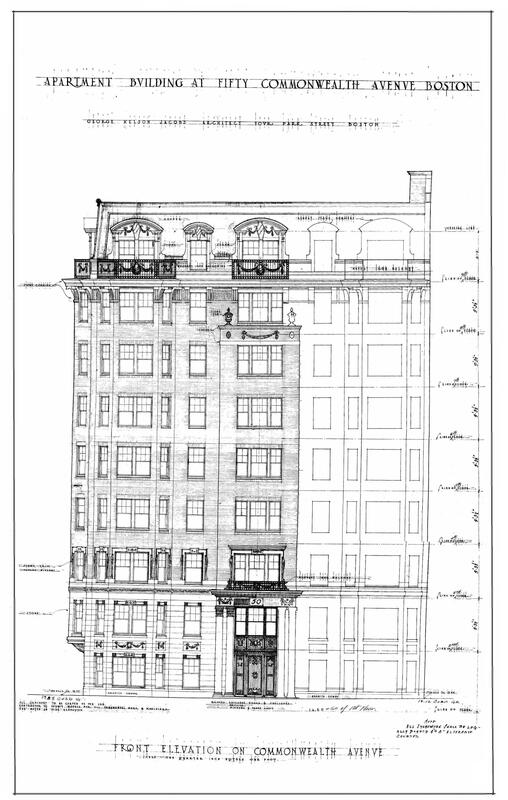 The commercial condominiums were to be located in the space formerly occupied by the restaurant, subject to zoning approval of converting the space from restaurant to office use. He also proposed adding a tenth floor penthouse, which would have increased the number of residential units to 41. On December 16, 1987, the zoning Board of Appeal denied the new penthouse but allowed the conversion of the restaurant space into offices. The original house at 50 Commonwealth was built ca. 1868 as the home of wholesale dry goods merchant John Hogg and his wife, Emma E. (Whiting) Hogg. They previously had lived at 156 Beacon. They also maintained a home in Framingham. John Hogg acquired the land for 50 Commonwealth on July 16, 1863, from importer, dry goods merchant, and real estate investor James Lovell Little. He had acquired the property from the Commonwealth of Massachusetts on October 30, 1862. James Little and his wife, Julia Augusta (Cook) Little, lived at 44 Chestnut and probably originally acquired the land to build their own home. Instead, in January of 1863 they purchased land at the southwest corner of Commonwealth and Arlington and built their new home at 2 Commonwealth. Click here for an index to the deeds for 50 Commonwealth (Demolished). The Hoggs continued to live at 50 Commonwealth in 1892, but by 1893 had moved to 74 Commonwealth. On November 1, 1892, 50 Commonwealth was acquired from John Hogg by Mary (Kane) Going, the wife of hat maker Frank R. Going. They previously had lived at 41 Mt. Vernon. After acquiring 50 Commonwealth, the Goings operated it as a private hotel called The Holland. Frank Going died in July of 1900. Mary Going continued to live at 50 Commonwealth and operate it as a private hotel. By 1910, she had been joined by Miss Josephine M. Bowen, who served as housekeeper. Mary Going died in August of 1912. In her will, after specific bequests to nieces and nephews, she left her estate, including 50 Commonwealth, to Josephine Bowen. Josephine Bowen continued to live at 50 Commonwealth and operate it as The Holland. She died in November of 1920. In her will, she left 50 Commonwealth to her sister, Frances Bridget (Bowen) Duffy, the wife of William H. Duffy, and the Duffy’s seven children: George, Dorothy, Margaret, Mary, Alice, William, and Joseph. William and Frances Duffy lived at 37 Train in Dorchester; he was a plumber. 50 Commonwealth continued to be a multiple dwelling but no longer was referred to as The Holland. On January 31, 1925, 50 Commonwealth was purchased from the Duffy family by Arthur Russell, and on July 8, 1925, it was acquired from him by Jacob J. Yonkers. On July 30, 1925, 50 Commonwealth was acquired from Jacob Yonkers by William B. Cohen and Edward Watchmaker, trustees of the Commonwealth-Berkeley Associates. In August of 1925, they acquired 52 Commonwealth. They subsequently demolished both buildings and built a new apartment house on the site. 52 Commonwealth was built ca. 1871 as the home of attorney Edward Ingersoll Browne. He previously had lived at 5 Allston. Edward Browne acquired the land for 52 Commonwealth on April 22, 1871, from dry goods commission merchant Samuel Frothingham, Jr., who had purchased the land from the Commonwealth of Massachusetts on January 17, 1866. He and his wife, Maria Louisa (Whitredge) Frothingham, lived at 317 Dartmouth. Click here for an index to the deeds for 52 Commonwealth (Demolished). Edward Browne was unmarried, and he shared the home with his mother, Mrs. Elizabeth Isabella (Tilden) Browne, the widow of Charles Browne, and his unmarried siblings, Harriet Tilden Browne and Francis Perkins Browne. On October 1, 1872, he transferred the property to his mother as a life estate and, on the same day, transferred seven-twelfths interest to his sister, Harriet, as a life estate (subject to the life estate granted to their mother), and the other five-twelfths to her in her own right. Elizabeth Isabella Browne died in December of 1884 and Francis Browne died in October of 1888. Edward Browne and Harriet Brown continued to live at 52 Commonwealth until their deaths in 1901, he in September and she in December. 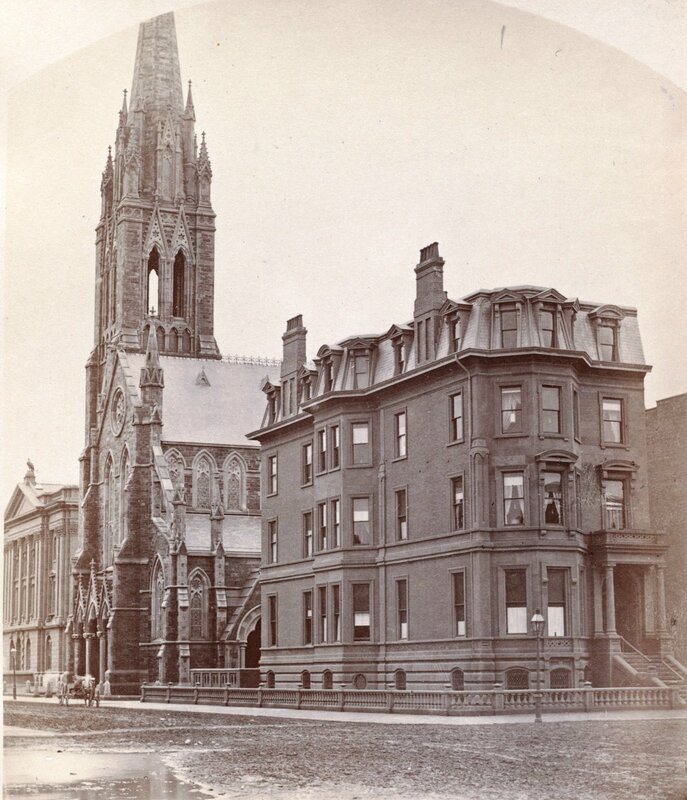 On March 26, 1902, 52 Commonwealth was acquired from the estates of Edward Browne and Harriet Browne by Joseph Cory Stevens, treasurer of the Boston Dye Wood and Chemical Company. He was a widower, and his adult sons, Joseph Earle Stevens and Arthur Wesley Stevens lived with him. They all previously had lived at 3 Newbury. Joseph Stevens died in March of 1905. On June 9, 1905, 52 Commonwealth was acquired from the estate of Joseph Stevens by Margaret (Chapin) Bazeley, the wife of real estate investor William Alliston Ley Bazeley. They lived at 306 Beacon and later in 1905 moved to 116 Commonwealth. One week later, on June 15, 1905, 52 Commonwealth was acquired from Margaret Bazeley by Anna Lee (Ames) Nowell, the wife of attorney George Manning Nowell. They lived at 522 Commonwealth and do not appear to have moved to 52 Commonwealth (two years later, they purchased 13 Commonwealth, which they razed and replaced with a new townhouse). On July 11, 1906, 52 Commonwealth was acquired from Anna Nowell by Mary (Sparks) Sharp, the wife of Arthur Russell Sharp. Arthur Sharp’s parents, Dr. John C. Sharp and Helen (Sayles) Sharp, had built 54 Commonwealth next door and his widowed mother continued to live there when Arthur and Mary Sharp bought 52 Commonwealth. Arthur Sharp had been affiliated with the Canoe River Cotton Mills in Taunton until 1903. After his leaving that firm, the Sharps had lived at 18 Marlborough during the 1903-1904 winter season. He then became general manager of the New England Yarn Company and they moved back to Taunton. At about the time he and his wife purchased 52 Commonwealth, he became treasurer of the Hamilton Manufacturing Company, another a textile mill operator. They continued to maintain a second residence in Taunton. 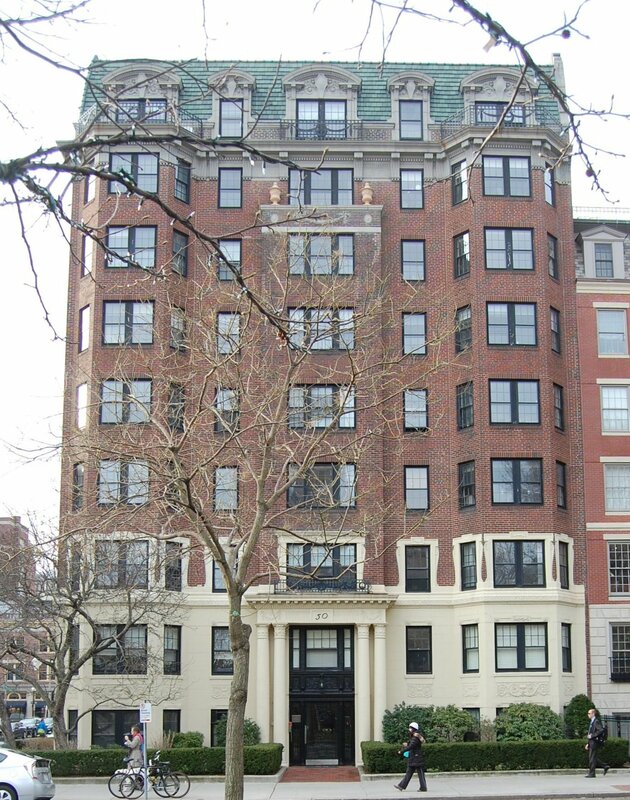 The Sharps continued to live at 52 Commonwealth until 1925, when they made Taunton their year-round home. On August 31, 1925, 52 Commonwealth was acquired by William B. Cohen and Edward Watchmaker, trustees of the Commonwealth-Berkeley Associates. In July of 1925, they had acquired 50 Commonwealth. They subsequently demolished both buildings and built a new apartment house on the site.